The new Toro TRX trenchers work faster and straighter than you'd ever expect from a walk-behind trencher. The track drive design provides a low center of gravity and large footprint offering stability and increased maneuverability - with out causing damage to existing turf. The tracks also disperse the weight of the machine, providing high floatation while delivering the necessary traction in loose sand or mud. 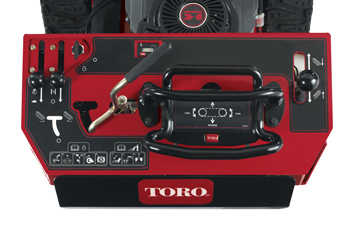 The controls work virtually identical to the easy-to-use Toro Dingo TX Models - so you can train new operators quickly. 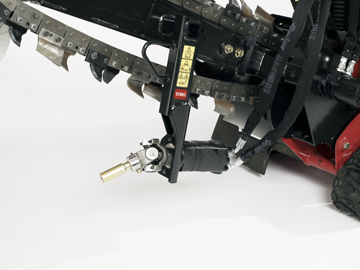 And the simple control system allows you to trench with one hand while adjusting the boom depth with the other. You'll be able to handle more jobs and complete them faster with virtually no physical effort. 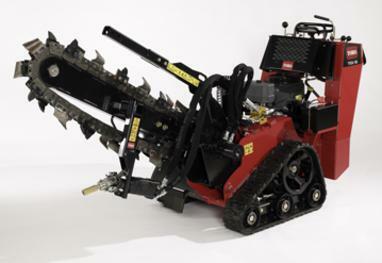 The Toro TRX Trencher is available with a 16hp, 20hp or a robust 26 horsepower Kawasaki twin cylinder engine. All models are equipped with the three-pump hydraulic system that delivers the necessary power to both tracks and the chain. The TRX's can dig up to 48" by 8" wide deep utility trenches in the most demanding ground conditions. It all adds up to faster trenching, which in turn adds up to faster profits. 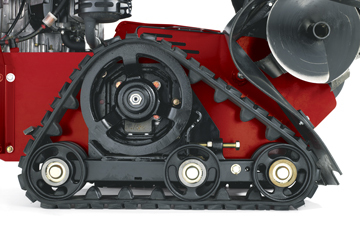 Add a bore head drive unit to your Toro TRX Trencher to easily bore under driveways and sidewalks to simplify irrigation and cable installations. Design allows for boring unit to be lowered into trench to aide in level operation. 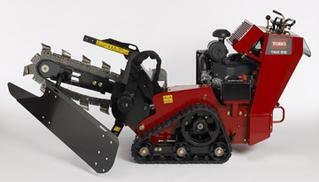 Add a backfill blade to your Toro TRX Trencher to complete trenching jobs by backfilling open trenches efficiently. 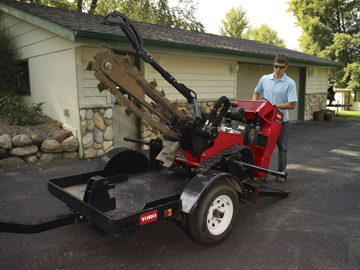 The Toro TRX Trencher is easy to load on any trailer including Toro's custom TRX trailer with easy to use built in securing system. $0 down and no payments until July on New Toro TRX Trenchers!